For a lot of patterns you need a knit fabric, like a jersey or wool plus some ribbing to finish the sleeves or sew a neckband. 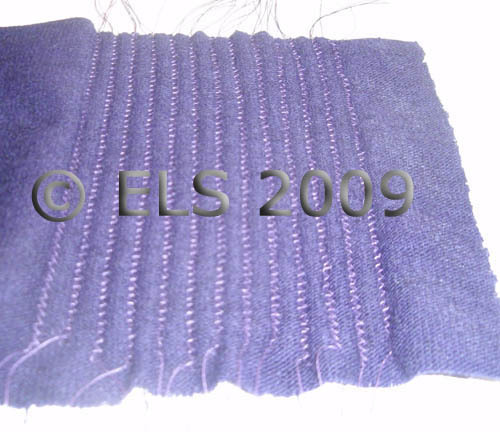 I know it can be difficult to find a matching ribbing for the knit fabric you want to use. I have bought cotton and acrylic ribbing in bright colors when I was making sweaters for my kids but I never found a wool ribbing. 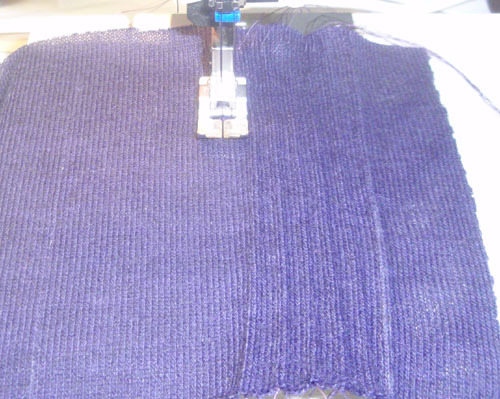 If you can’t find the right matching ribbing you can make your own faux ribbing, using the same knit fabric, and a twin needle. by Dorothy Amo back in 1996 April/May issue 64. I made the neckband from a folded pin tucked piece of the wool. After the pintucks were sewn I measured the needed wide and sewed the band together with a regular stitch and finished the outer edge and attached the band around the neckline with a 3 thread serger/overlocker. 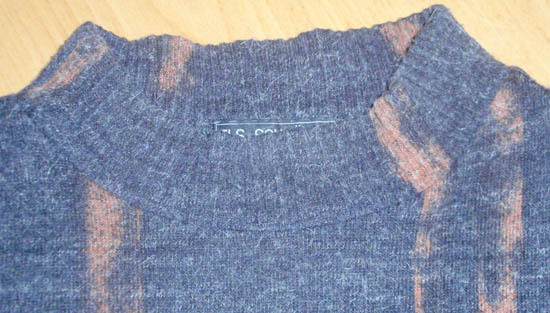 I topstitched the band seam allowances around the neckline again with a twin needle. For the sleeve cuffs I sewed pintucks for a length of 20 cm and finished both edges with a 3 thread serger and traced the part of the sleeves which I wanted in pintucks , sewed the ends together , attached to the sleeves and used 4 cm for the hem wide and hand stitched the hem since I did not want to use a visible line of stitching. As you can see the sweater is old but it is only to show what is possible if you make the matching ribbing your self. I marked the knit fabric on 10 cm and starting to sew pin tucks, the wide between the pin tucks is 4 mm and I have 13 pin tucks for the 10 cm wide fabric which leaves me with 8 cm wide faux ribbing. The size of the stitch length I used was 2,5 and the tension on high at 8. I used my normal sewing feet and set the needle on 4 towards the right. 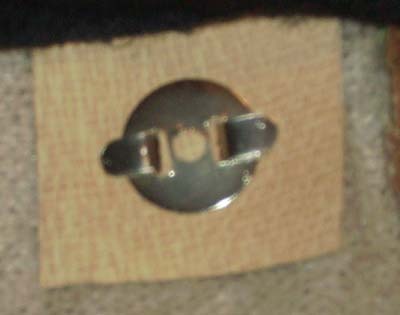 I used my sewing foot as a guide for the previous sewn pin tuck. I used the sample to make a cuff for the sleeve . 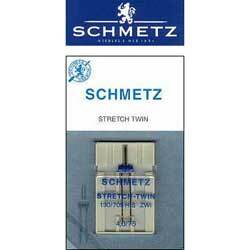 The amount of stretch depends on the stretch factor and stretch recovery of the fabric plus the amount of pin tucks. 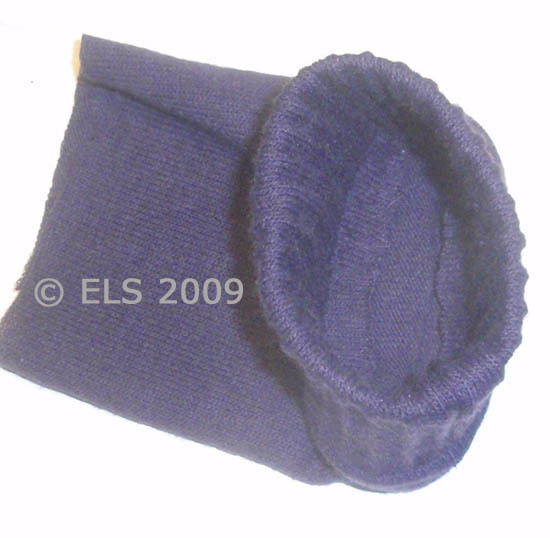 In this case the cuff 10 cm wide and it can stretch towards 14,5 cm. It is best to make a sample first. 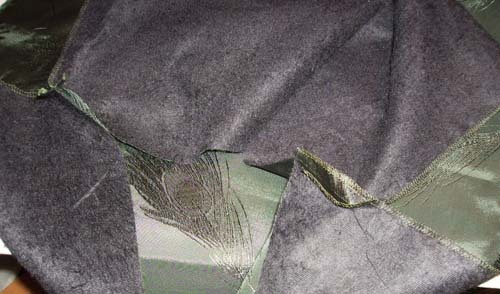 but did not finished the edges as you can see inside the sleeve. 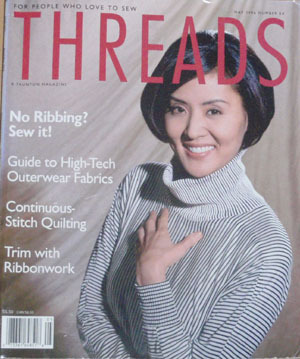 If you want to explore more about this sewing technique try to find a copy of Threads magazine issue 64 which shows detailed pictures and a lot more information. 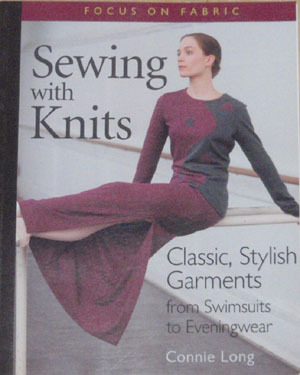 or find a copy of the “Book Sewing with Knits” by Connie Long , she also covers this type of sewing ribbing in her book. Last year I ordered some fabrics included a few yards of a beautiful silk tussah fabric from Melody at http://www.fashionistafabrics.com/, which I used to make a long jacket. I already posted some pictures of my sleeve in the blogpost sleeve heads. The jacket design and pattern are drafted by me. The collar is 2 3/8 inch wide (6 cm) and needed some more structure besides the sturdy woven fusible interfacing to keep its shape, so I used some rigilene boning threads. 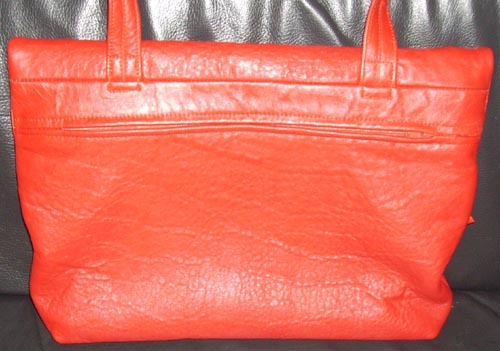 For this shoulder bag I used 2 brick-red leather hides, both were about 7 ½ foot large. 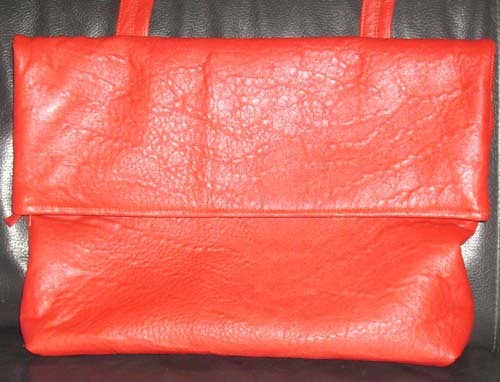 This bag is a rectangle shape, zippered pocket on the front partly hidden under the flap and one zippered pocket at the backside for easy access. 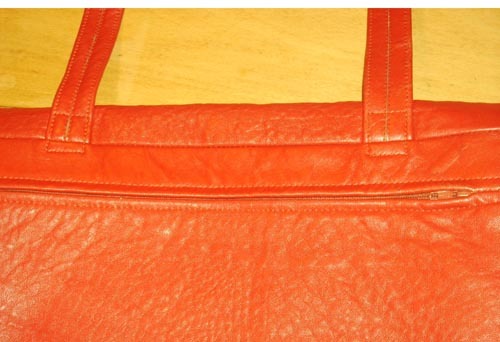 Plus an inside pocket at the backside of the lining bag and a key lash stitched at the side seam of the lining bag. 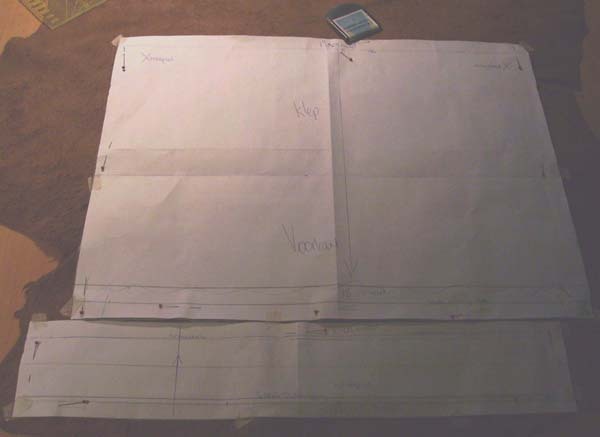 I drafted a rectangle shape on paper with a fold over flap and measured my leather to see if I had enough leather, copied the rectangle paper pattern and add the several pieces for the pockets front and back and added a small piece to attach the shoulder straps, added seam allowances (3/8 inch (1 cm) for the side seams and 5/8 inch (1,5 cm) for all the other seams). After cutting out the pattern parts from the interfacing I taped the paper pattern still with the interfacing pinned ontoo the leather with some medical paper tape. The small pictures are all ThumbNail , just click and you see a larger image. I made a long shoulder strap so I could wear this bag also crossed over. The strap is sewn with 3 pieces to get that extra long length. 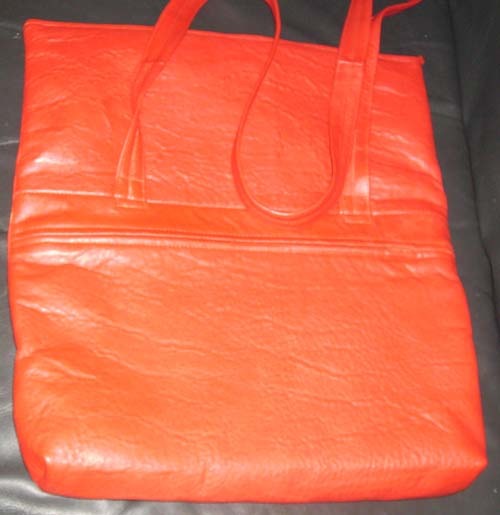 The size of this bag is 17 inch (43 cm) wide, 12 inch (30 cm) high. The total height is 17.7 inch (45 cm). 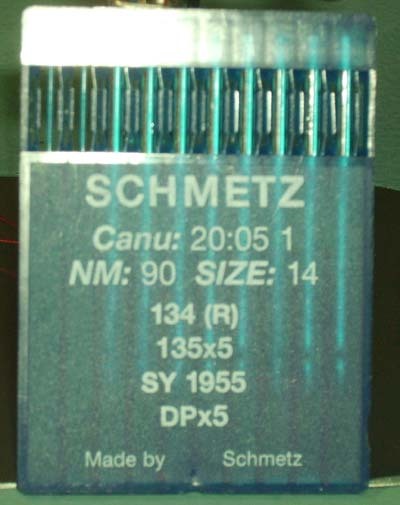 Bottom depth is 2.4 inch (6 cm). 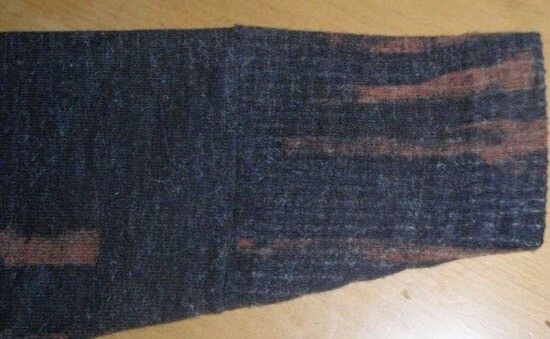 Shoulder strap is 59 inch (150 cm) long and 1 ¼ inch (3 cm) wide, so I also can choose to wear it crossed over. 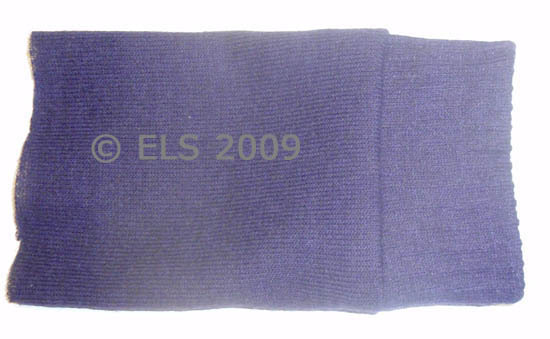 Outside pockets are 13 inch (33 cm) long and 6 1/8 inch (16 cm) deep. 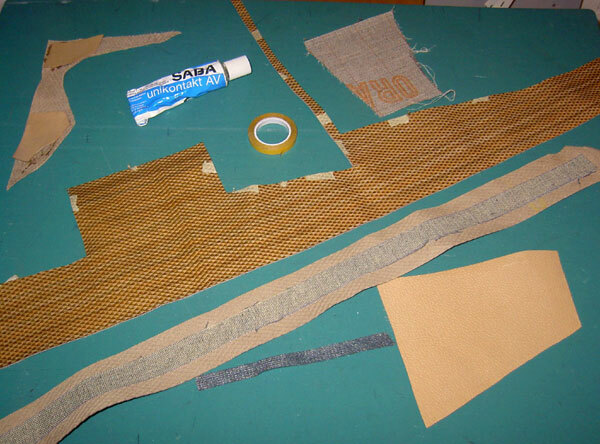 I started with fusing leather interfacing to all the parts except the shoulder straps. 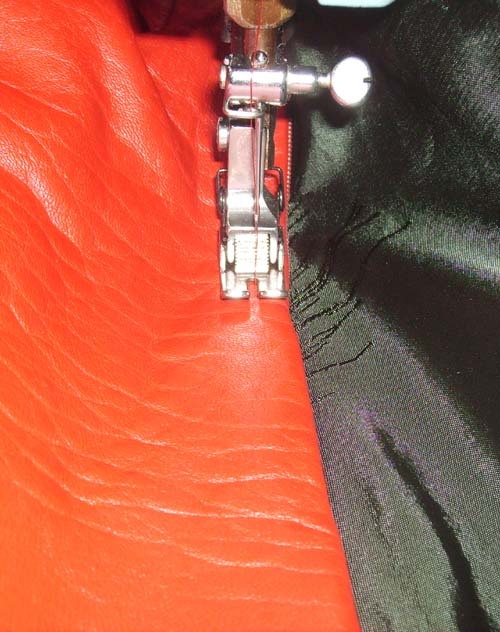 This non-woven interfacing is special made for leather because it can be fused with a low heat iron. The bottom part and the part where the shoulder straps are sewn between are fused with a heavy hair canvas interfacing for some added strength. All the seams are stitched and glued and flattened down before any stitching from the right side. 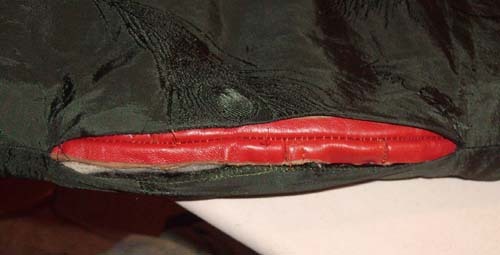 The zippers are sewn at the pocket openings, between the already closed seams. I marked the seam allowance wide with a pencil (by folding the allowance back to the inside with the zipper teeth just inside the fold line) and glued the fold line of the zipper/pocket opening. The marked pencil is a guidance line only. Then I used craft double-sided adhesive tape cut in half (because I only needed a narrow piece) to attach the pocket lining over the zipper-tape. 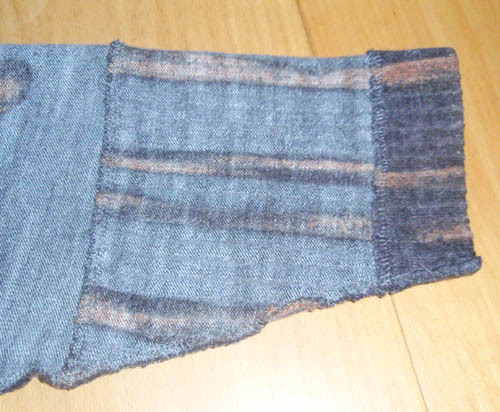 Raw sides of the pocket lining and seam allowance match. Now the other side of the pocket lining and zipper are stitched. 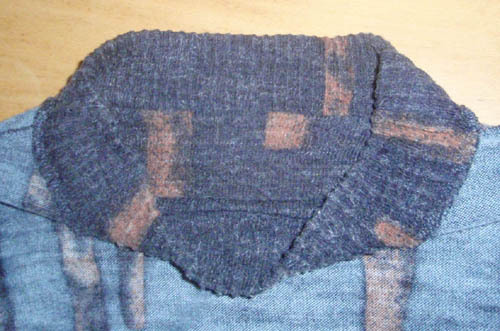 The next step is sewing the pocket lining pieces together to form a pocket. 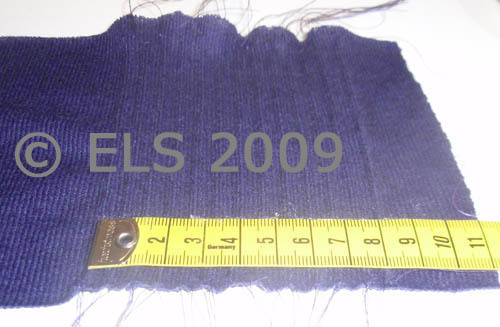 The lining for the bag is interfaced with a woven interfacing for adding some strength. The leather is sewn with my new purchased “used” Singer 20U machine, Güterman strong polyester thread size 100 and sewing machine needle size 14/90. I used several sewing machine feet for sewing this bag. The Teflon and roller feet are great for sewing leather. I also used the Right Hinged Narrow Cording foot and glued some Teflon tape under the foot for top-stitching the shoulder strap at the center. The Right Compensating Top-stitch Foot was great to edge stitch the shoulder strap. Lining leather for reinforcing the magnetic snaps and to cover them so the metal parts will not weaken the lining. The inside lining pocket 7 x 7 inch (18 x 18 cm) is from a double layer of lining with the opening at the fold line which I glued down with a strip of double side fusible hem tape. The pocket is stitched around right sides together but I left a small part open at the bottom to turn the pocket inside out. 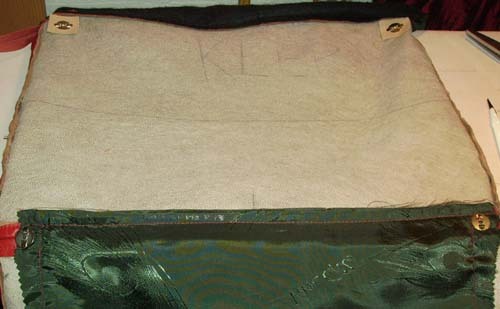 Pressed and edge stitched at the lining bag. 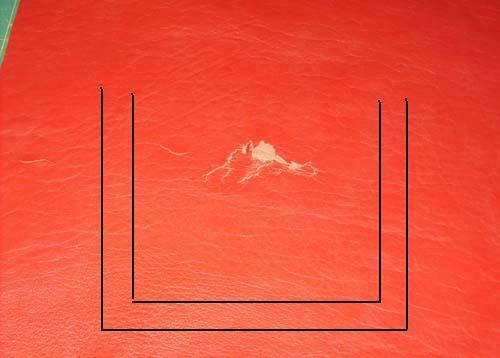 There was some leather left but it was damaged, but I could use this part and cut around the damaged spot and add some color to the inside pocket. I made a template 3/8 inch (1 cm) wide and 3/8 inch ( 1 cm) wider than the length and wide of the pocket so the edges of the pocket is covered by nearly 1/4 inch (1/2 cm) and stitched the leather around the pocket edges. I used a Pritt glue stick for temporarily securing the leather around the pocket edges and used the zipper foot to stitch it close to the edges. For the bag opening I used a different zipper a non-separate one which can be used for garment sewing like in a a dress. This zipper has a smaller and narrower zipper coil, which does not add weight and is more flexible for the purpose of this bag. The zippers I used for the pockets are separate ones which are sturdier. secured the lining side seams about halfway down with a couple of stitches towards the leather side seams and sewed a few stitches at the bottom of the bag to attach the leather and lining bottom together. 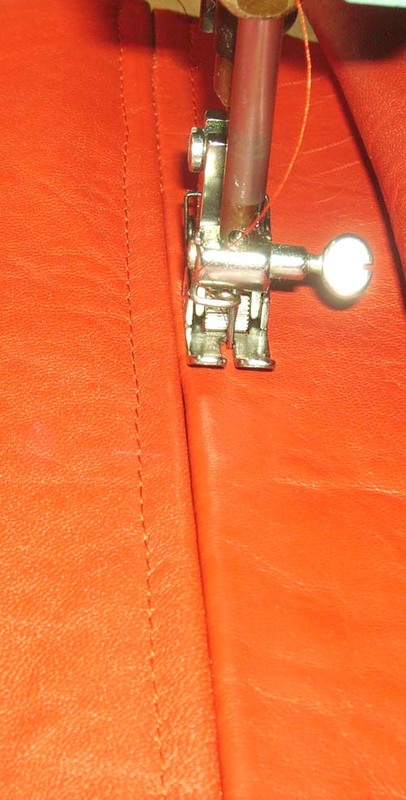 I closed the opening in the lining bag side seam, (which was needed to turn the bag inside out) with a ladder stitch. Since the inside of the shoulder strap was not as nice butted together as it should be, although I tried to do it right by marking a line at the center where the edges would meet eachother. 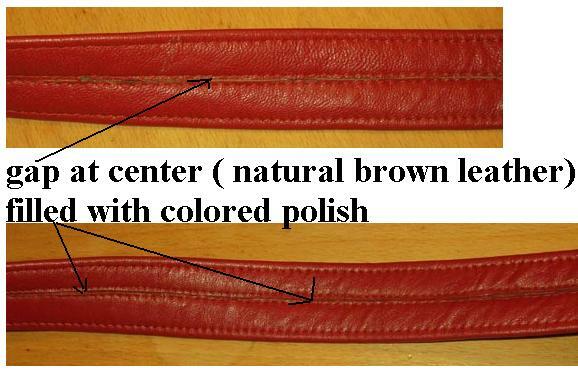 I noticed that after stitching a hairline away from the center edges with the zipper foot and topstitch from the right side along the outer edges there was a small gap which showed the natural leather color. I bought some leather colored polish to fill in the gap. I was lucky that the color brick red is the same as the bag. Used a narrow tiny brush to “paint” the gap between the folded and stitched edges to cover the natural brown suede leather which on some spots was visible. 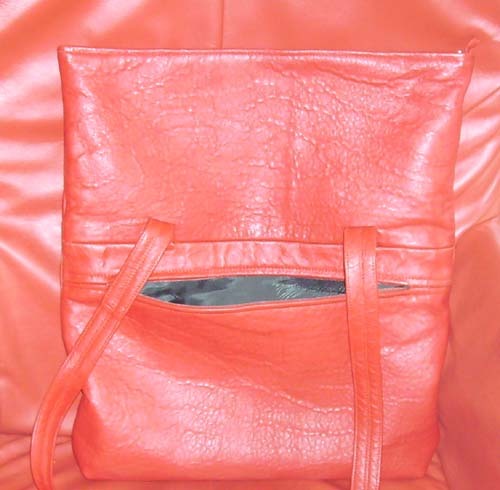 Also a bag stop was glued at the center of the inside shoulder strap. This bag stop prevents the strap from gliding of my shoulder. This last thumbnail picture reflects the true color of my new bag the best. My store bought black leather bag was worn out so I made a copy because I still liked the design and the size. 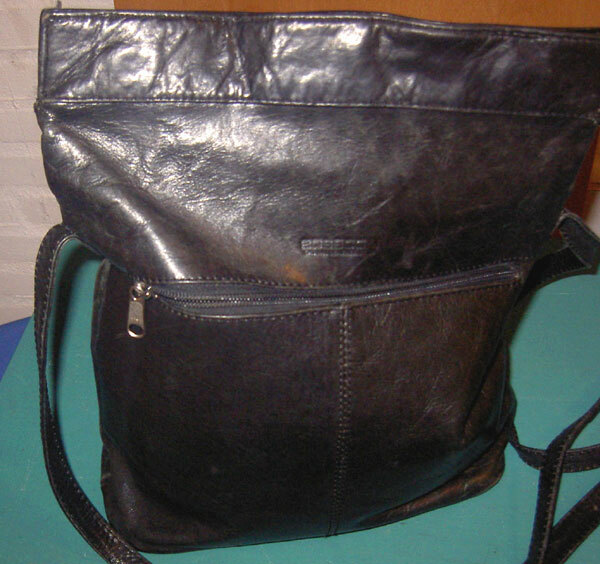 This was one of my first leather bags I made. 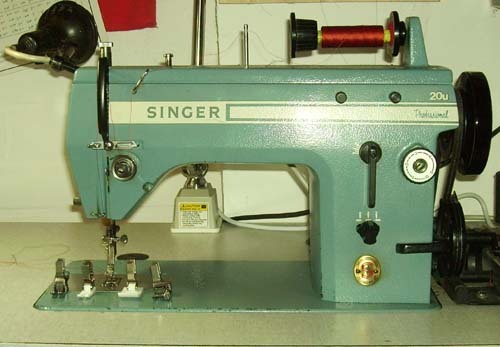 Sewing is done with a commercial sewing machine and regular sewing machine needles. I used a printed sturdy leather , several interfacings , lining leather to reinforce the bottom, leather glue , leather tape to reinforce the zipper opening, medical paper tape to secure the patterns on the leather while I did cut the leather with a Kai cutter. A hammer for flatten the seams. 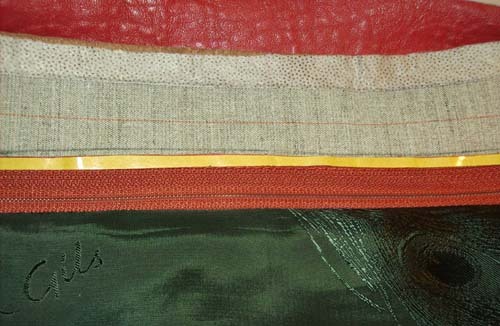 Hansel leather interfacing which can be fused on a low temperature. The inside pockets, one welt pocket with a snap, one zippered pocket, pen holder, cell phone holder and key ring holder. 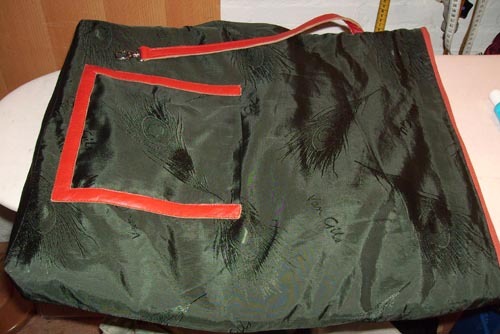 The dark green lining is interfaced to give it some more durability, because this lining is not a sturdy bag lining. 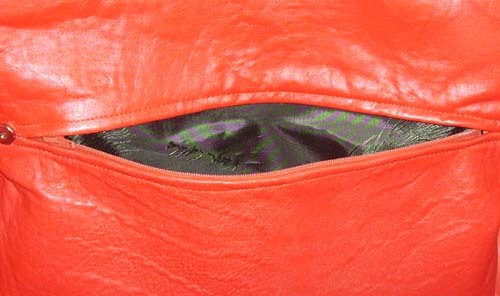 The bag closure is done by 2 bag snaps and a piece of Velcro which acts as a pickpockets alarm. Added a bag stop at the inside center part of the shoulder bag so the strap stays on my shoulder . My last post for this year is about a bustier and 8 gore godet skirt I made 2 years ago, one of my nieces is the model so the patterns are drafted on her measurements. The fabric I used was stretch polyester satin and viscose embroidered tulle, polyester habutai lining. Interfacing a lightweight woven stretch for the top, bustier interfacing and soft tie interfacing for the extra bust padding. Petersham ribbon for the skirt waistband, Rigilene boning and spiral steel boning. Invisible zippers for the skirt and the bustier. Because there are no instructions or pattern to review I add pictures so you can see some details for those who are interested in some techniques I used for this outfit. The skirt was easy to sew I used a 60 needle and alterfil thread which prevents puckering, due to the coating of the thread . Pressed the seams open and used a 3 thread serger to finish them, just as the lining skirt. The skirt and lining are sewn together at the waistline, pressed a fusible stay tape just above the stitch line for the waist and I used petersham ribbon for a facing at the waistline.Since I only had brown petersham ribbon in my stash I covered the ribbon with a bias cut fabric after I pressed the petersham outer edge in shape. 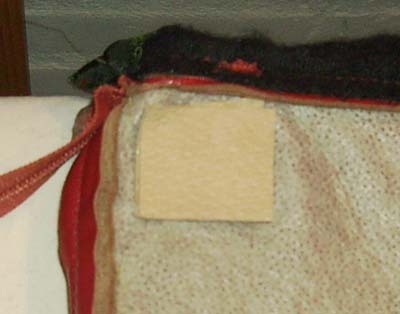 The cover is pressed open by using the edge of a wooden paint spatula since this was narrow enough to get inside the fabric cover. I thread marked the waistband for corresponding seams and stitched the facing at the waistline of the skirt. Turned the waist face band under and pressed in place. Attached the waistband to all the seams with invisible hand stitching. The bustier is supported by an inner bustier made of a special heavy bustier woven interfacing. The bust padding I used is to add some more “body”, but also can help as a support for a more voluminous bodytype. I used a soft tie interfacing for this padding and this is stitched onto the inner bustier interfacing, see diagram pattern. The stitching line is a sewing foot away from the previous line. Start and finish the padding 3/8 inch( 1 cm) from the centerpart and side panel.The depth depends on the bust depht. To prevent stretching out I used strips of bias cut lining which I steam pressed first.This so called stay-tape is sewed at the upper and bottom edges of the inner bustier.I marked the measurings from each panel at the seam allowance. The rigilene boning is stitched over the bust seam allowance till under the bust there I split the boning and removed the covering partly and cut off the center plastic tubes till I left 2 tubes at the left and right side. 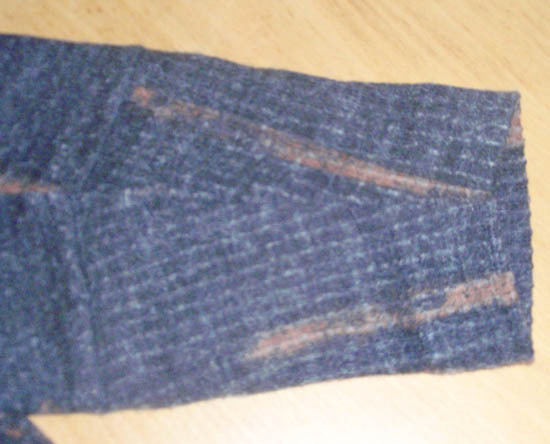 Those tubes were sewed by using a zigzag stitch but only at the seam allowances (left and right side). Piping filled with a tiny cord which is sewed at the bustier around the edges. 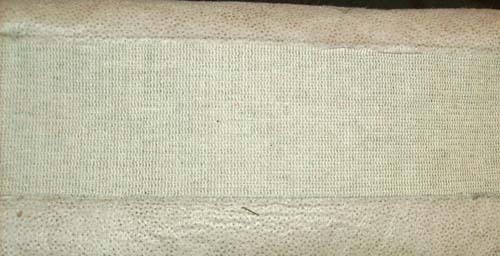 The excess wide of the lining stay tape is cut off later. Tulle lay out using the already interfaced fabric parts as a guide. Hook and eye tape which I used but covered with lining fabric. I did cut 2 additional panel parts to use as a tightening piece of strength, so the invisible zipper would not have to hold the body tight on its own with the risk that the zipper will separately itself. The extra panels are cut from a sturdy cotton covered with lining and sewed at the inner bustier panels. The invisible zipper is too long but needed to get dressed, to keep the extra length of the zipper inside I used a snap . The “male “part is sewed at the end of the zipper and the “female”part is sewed just besides the zipper start at the lining. On the next picture you can see that when the zipper is closed and the hook & eye tape panels are not closed yet, they are smaller in wide about 3/8 inch (1cm) because when this is closed they have to hold the body tight and not the zipper. To keep the lining snug under the bust I sewed a small fish eye dart.